The Healthy Brain makes the compelling case that most people’s brains are underperforming because they are undernourished. As the most metabolically active organ of the body, the brain’s nutritional needs are ten times higher than those of any other organ. That means the brain is the first organ to falter when it is improperly fed. 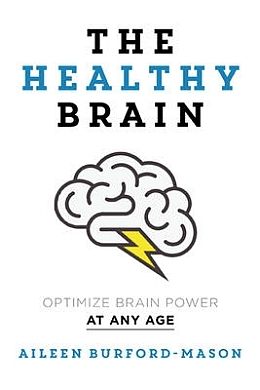 Well respected for her ability to take complex nutritional research and translate it into clear, evidence-based guidelines for the safe, effective use of supplements, Dr. Burford-Mason offers step-by-step guidance on how to implement dietary changes and select appropriate supplements for optimal brain power at any age. She makes liberal use of real-life case histories from her practice and summarizes leading-edge scientific research to support her advice. The immediate payoff of adopting Dr. Burford-Mason’s strategies is a noticeable increase in brain vitality: better mood, focus, creativity and workplace performance, and an improved capacity to enjoy life, sleep soundly and cope well under stress. The long-term benefit is that these same dietary changes have shown the most promise in helping us avoid Alzheimer’s disease and other forms of dementia. Dr. Aileen Burford-Mason, PhD, is an immunologist, cell biologist and orthomolecular nutritionist—a specialized field of nutrition that uses diet as well as vitamins, minerals, amino acids and other substances naturally present in the body to treat and prevent disease. She is the author of Eat Well, Age Better, and is one of Canada’s leading advocates for advancing the scientific basis for nutrition. She was an assistant professor in the faculty of medicine at the University of Toronto, and the director of a cancer research laboratory at Toronto General Hospital.